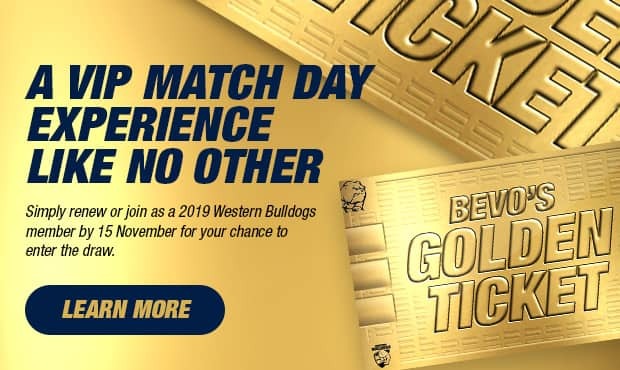 Want to get your hands on the 2019 Bulldogs’ Golden Ticket? With the 2018 season complete, and 2019 fast approaching, Western Bulldogs memberships are now available. And if you renew or join by Thursday, November 15, you’ll go into the draw to win the ultimate VIP match-day experience in the Bulldogs’ Golden Ticket Promotion. With a friend, the Golden Ticket winner will enjoy witnessing the build-up to a match from the rooms at one home game during the 2019 season. They will be treated to a premium hospitality experience during the match, and return to the rooms afterwards to soak in the atmosphere post-match. Thanks to Mercedes Benz Vans, the winners also receive VIP transfers to and from the ground. If you miss out on the Golden Ticket, we’ll have other special prizes up for grabs, including signed and match-worn merchandise. With a price freeze in place for home and away members in 2019, the Club continues to offer the same cost-effective prices for a range of our membership options. Membership packages are available to suit everyone’s needs, with a number of new junior membership options including the ‘Rookie’ membership (for children aged 5 – 9 years) and the ‘Rising Star’ membership (for children aged 10-14 years). All members will now be able to add reserved seats for games at Ballarat’s Mars Stadium to their 2019 membership, maximising the opportunity to secure the best seats in the house. If you are unable to make it to every home game, the new five-game flexi memberships will have you sorted, starting from just $110. Western Bulldogs AFLW memberships remain $50 for adults and $25 for juniors. 2019 will also see the launch of a brand new loyalty program Red, White and True. For more information on all Western Bulldogs membership options, call 1300 46 36 47 or visit membership.westernbulldogs.com.au.